PLEASE NOTE: IT IS DIFFICULT TO VIEW THE BEAUTY OF THE INVITATION STYLE IN THE THUMBNAIL VERSION. BE SURE TO CLICK ON THE THUMBNAIL TO VIEW THE DETAILS IN THE DESIGN. 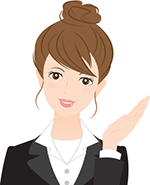 We hope you will enjoy browsing through our site. We have prepared the following details to help you along. As you click through our many different designs you will notice that the invitation styles come in different sizes and in different paper textures. If you see a design you like, and would like it on a different paper stock or size, call us for availability. It may be a standard item. These papers are usually available in all sizes. The standard paper stocks are usually available in white, natural ecru, and sand. Colors above are for display purposes only. Call us for actual color samples. 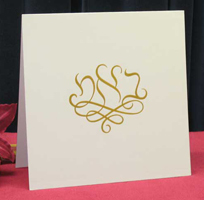 WHAT'S POPULAR IN WEDDING INVITATIONS? The most popular format is printing one version of the text (either Hebrew or English) on the cover, and the other version on the inside. However, some of our customers prefer to place a monogram on the outside and place the Hebrew and English text side by side. The most popular monogram position is always on the cover. When printing Hebrew text on the cover, the monogram is placed beneath a curve of type. This looks very pretty. When placing the English text on the cover, the monogram is placed above the English text. The most popular borders are the Round Corner and the new Panel Border. 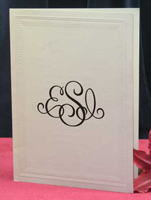 Many of our customers are ordering invitations without any border, but are enhancing the cover design with a custom monogram embossed or printed under the arch. 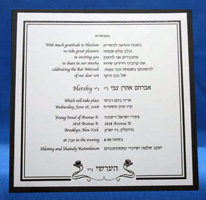 WHAT'S POPULAR IN BAR/BAT MITZVAH INVITATIONS? 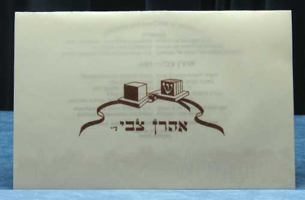 Many invitations are a card with the Hebrew and English printed side by side. Backings are available in Blue, Burgundy, Green, Red, Silver, Gold, Brown, and Black. Many other colors are available upon request. Transluscent (see-thru) paper has made a comeback. This stock can be used either as an insert with the Hebrew and English text printed on it, or as a cover with the name or design printed on. Gold in very popular for weddings. We use a beautiful metallic gold. Colors above are for display purposes only. Call us for actual color samples. When considering quantities, be sure to note that additional invitations are inexpensive to order - as long as the entire quantity is ordered at the same time. However, if you will run short on invitations and will need to reorder, you order can be quite costly. Ordering 50 extra invitations is like taking out an insurance policy against running short. You never lose by playing safe.